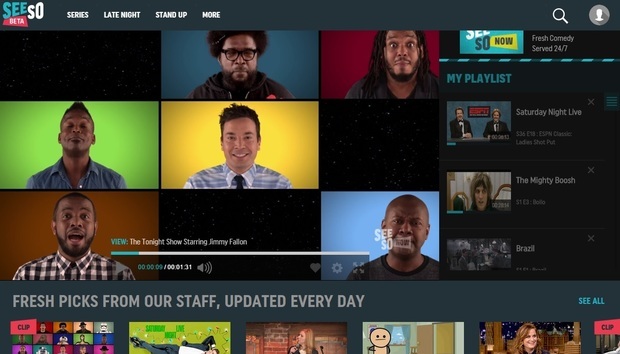 NBC has more streaming video plans in store after last week’s launch of SeeSo, the new service for comedy geeks. Evan Shapiro, NBC Universal’s executive vice president of digital enterprises, recently told Decider that the network is planning up to nine more streaming services for 2016. Shapiro didn’t get into specifics, but said the strategy is “pretty well indicated by what we’re doing with SeeSo,” suggesting the new services will also cater to niche interests. SeeSo is a $4-per-month, ad-free service featuring comedy that often aims to be surreal, dark, or just dry. It includes a mix of NBC comedies and late night shows, licensed programming (such as Kids in the Hall and Monty Python’s Flying Circus), and original programming. NBC has promised more than 20 original series for SeeSo in its first year, and Shapiro said they’ll roll out at a pace of three to five original series episodes per week. The challenge, then, will be for NBC to find niches in which original programming can be produced in a cost-effective way. With comedy, it’s simple enough to film an existing comedy show or sketch performances, but other genres such as sci-fi and horror might be trickier to produce on a tighter budget. This makes me wonder if NBC’s future services will veer toward lifestyle formats such as cars, sports, and food, rather than genres that require a lot of scripted programming. Either way, NBC’s efforts will be interesting to follow. Why this matters: As I’ve written before, SeeSo represents a new kind of channel for the age of Internet video. Instead of subscribing to a giant cable-TV bundle, the average viewer might choose one or two premium services (such as Netflix, Hulu, or HBO Now), supplemented by cheaper niche subscriptions and free ad-supported services. We’re already seeing Amazon pursue this strategy with its new add-on packages for Amazon Prime, and it seems NBC also wants to get on board with this approach sooner than later.